Education themes have the power to present classes, professor information, projects, and even options for sending in tuition. These themes provide tools for scheduling. Responsive design is more important than ever as well, considering so many students are looking for class info on mobile devices. The good thing about a WordPress theme is that you don’t need to be an advanced designer to use one. Plus, you can complete your own maintenance to keep costs low during the early stages of building your schools online presence. We like to see some eCommerce functionality with all educational themes, as this presents a way for schools or universities to collect payments for classes. In addition, it’s nice when an education theme provides drip content (or integration with a plugin that does this). Drip content only reveals classes as a student progresses through the lessons. The themes need modules that organize course information in a reasonable manner, and leads to the coursework themselves, with media support such as PDF downloads and videos. 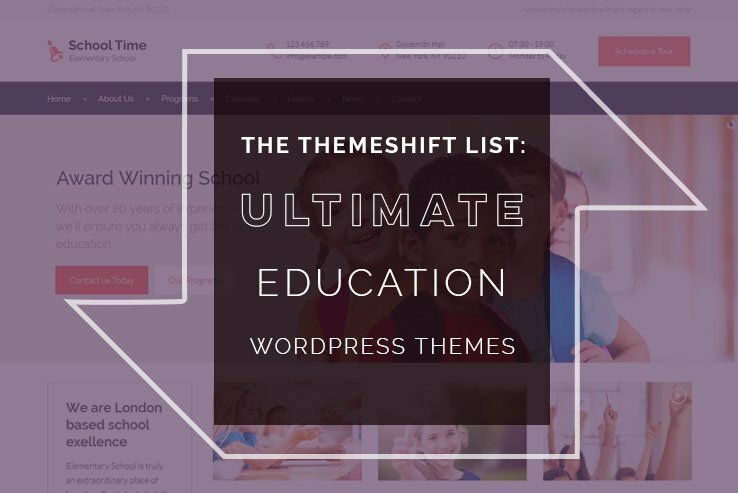 Education WordPress Themes: Who Should Get One? 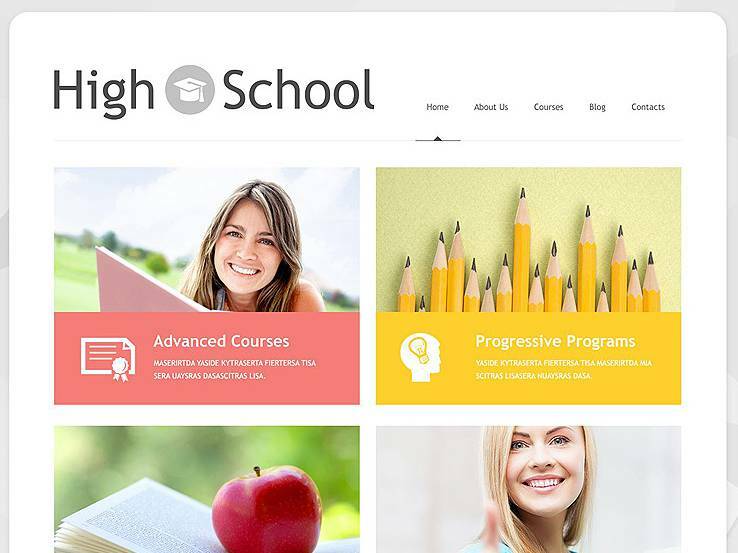 Schools of all sizes should think about getting an education WordPress theme. We enjoy the themes for existing universities, colleges, and lower level schools, along with new schools similar to Khan Academy. Brick and mortar schools can utilize the themes for presenting information and collecting tuition, while online schools take advantage of those tools along with full course pages. The good part about a theme is that it doesn’t necessarily matter how big your school is. WordPress sites support tons of traffic if you have the right hosting, but you can also launch a small, niche online course for your blog as well. You’re bound to stumble upon other education themes that aren’t covered in this article. We love the ones listed below, but we’re always up for new additions! Therefore, let us know in the comments if you discover one or two wonderful themes that might fall into the education category. The EducationWP theme uses the #1 learning management system plugin called LearnPress. The plugin facilitates your entire list of courses, with modules for users to sign in, along with options for making outlines and uploading valuable media items. Quite a few premium demos are included, such as the university demo and the one-page course demo. You can install these within seconds to ensure that you have the right interface for your particular style of school. The best part about a theme that runs with LearnPress is that you receive a pack of extensions worth more than $500. For example, one of the extensions is there for dripping content as people advance through courses. Another one prints out a certificate of achievement when a user completes a course. The drag and drop course builder cuts out the need to use code. While the selling of courses through WooCommerce, allows payments with options like PayPal and all credit cards. Along with subscriptions, memberships, bbPress integration, and an event management module, the EducationWP theme is one of the best solutions out there. 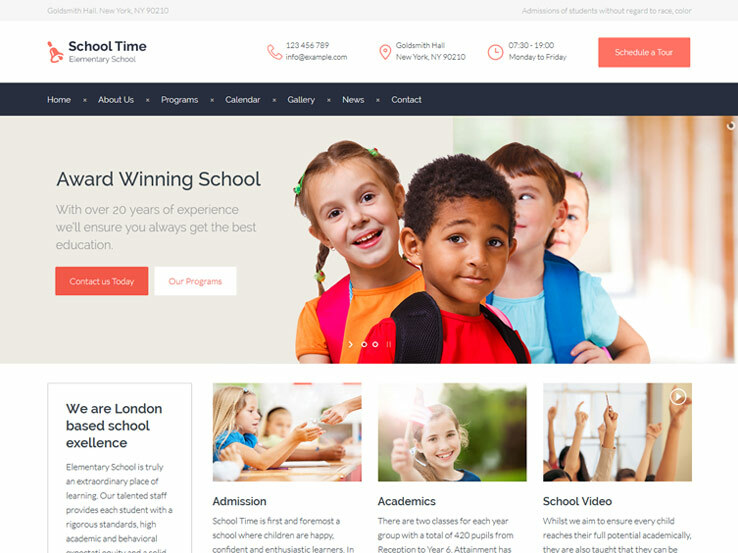 The Schoolmaster WordPress theme is a colorful and somewhat playful educational theme that welcomes visitors in a more pleasant way. The primary homepage displays course categories with featured images and course descriptions. 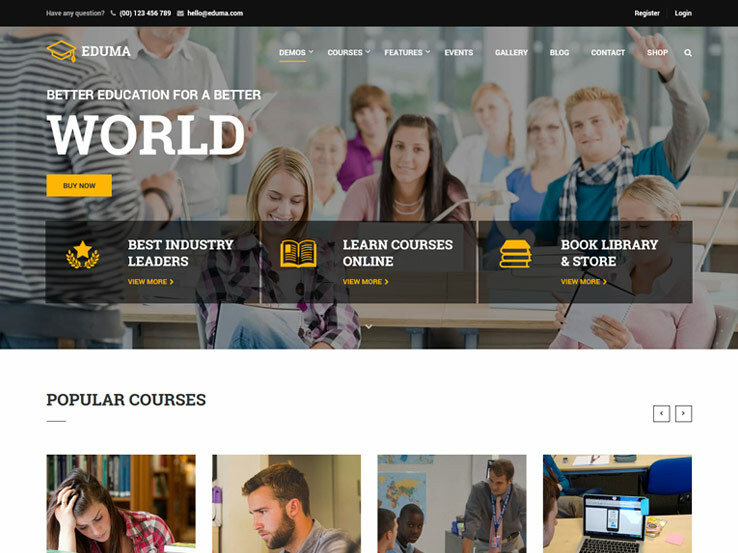 The theme has a responsive design for students to open the courses on mobile devices, and the fully editable theme provides custom post types for quotes, audio, videos, and more. The theme is completely ready for multilingual use, just in case you need to convert the text into something like Spanish or German. 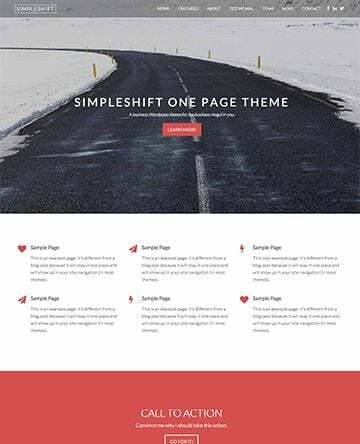 You can also find over 80 shortcodes with this package, improving the way you develop your theme with items like buttons, columns, lists, audio, and video. The two-step installation only takes a few minutes, and the multiple color options are sure to help out with branding your school website. We like the portfolio for presenting course topics, while the custom widgets are there for everything from social sharing to comments. We recommend using the default backup system, just in case your site crashes. Finally, the fantastic sliders let you upload banner images for new course announcements. 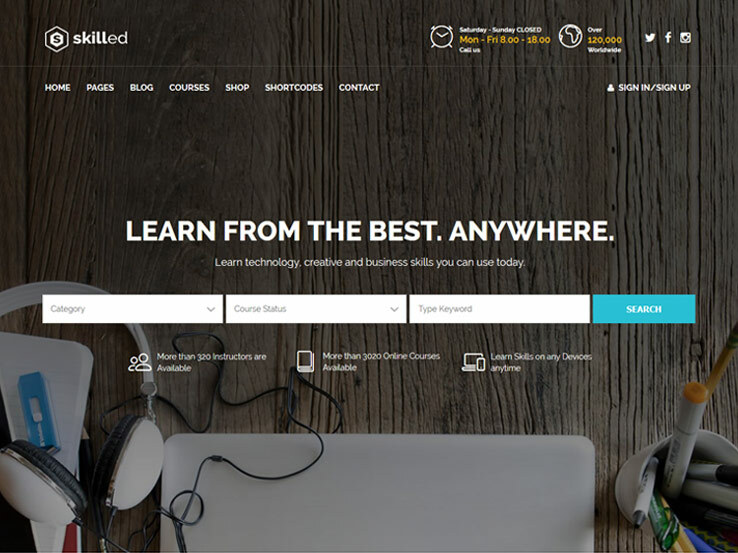 The Skilled WordPress theme is for education learning courses and classes. It lets you present the courses in a professional format, using WooCommerce to collect the payments from students. Sensei is a learning management system plugin from WooCommerce, and it integrates with the Skilled theme for writing lessons, adding quizzes, and everything else you need to do for a successful online course. You also gain access to an event calendar, giving you the chance to present event information for students to prepare for what’s coming up in the future. The Contact Form 7 plugin works just fine with the theme, and you get quite a few other add-ons like the Visual Composer plugin. The Visual Composer plugin delivers a drag and drop interface for easy development. 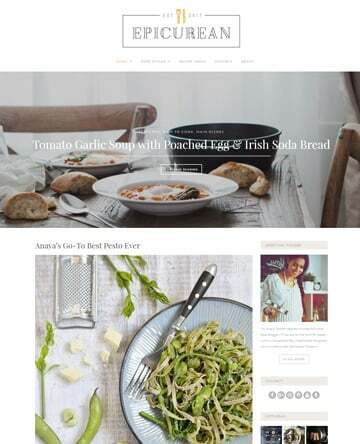 We also like that the Skilled WordPress theme comes with the LayerSlider plugin, a solution that’s excellent for all skills levels who want to make a featured image presentation at the top of the page. Finally, four demos are packed into the theme, giving you a little flexibility to design the frontend you think reflects the mission of your school the best. 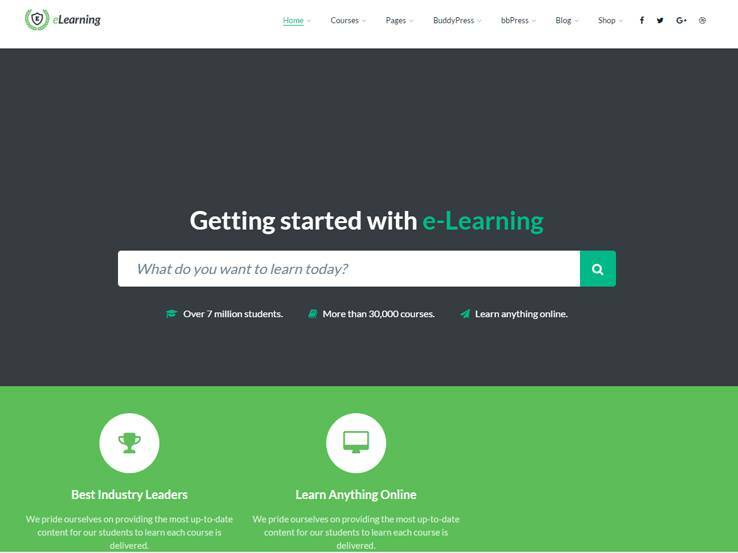 The Elearning WordPress theme is a learning management system theme with a unique header module for users to search for courses and locate the ones that fit their needs the best. All developers who use the theme can create and sell courses easily with the LearnPress plugin. The plugin allows for multiple quizzes and questions, and it sends out certificates when people complete the courses. The modern and responsive demos range from professional to more playful, while the one click installation ensures that even beginners can get started with the Elearning theme. A drag and drop page builder is built into the theme to eliminate the need for coding. Each of your courses are sold through either PayPal or Stripe, providing a low cost, simple way for students to make their payments. The amazing parallax effect strives to grab attention when people land on your school website, while the one-page site is an option to linking from Google Ads. The unlimited colors and skins some in handy during the design phase, while the custom CSS works nicely for those more advanced developers. Along with Google Fonts and Font Awesome icons, the tools inside Elearning fail to disappoint. The SchoolTime theme shows great promise for elementary schools and even some higher-level educational institutions. 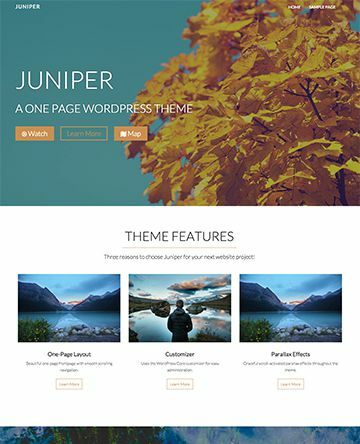 The theme comes with the Visual Composer plugin for a smoother design process, and you also get the LayerSlider plugin for a beautiful presentation on the homepage. The event calendar shares all of the upcoming courses that students should prepare for, while the contact form is built-in for parents and students to send in questions whenever they have them. The Smart Grid Gallery plugin is certainly something to get excited about, since it comes with the theme for free, and it’s one of the easiest ways to share galleries with pictures of your school. The two demo layouts get you started quickly, and the unlimited colors are essential for matching up the color scheme with your logo. The inner pages are the real heroes, with options for talking about your teachers and events. You’ll also find a page for a message from the principal, along with a full list of classes. The Flat University WordPress theme does indeed have a flat design, making it one of the most modern choices on this list. 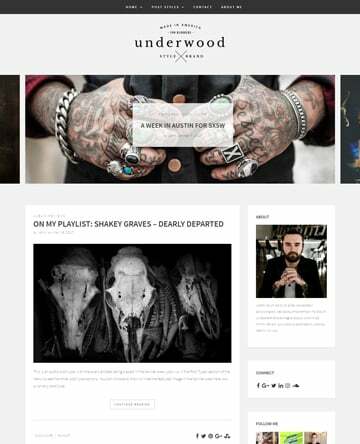 The responsive design looks beautiful on all devices, while the fully editable theme provides post types and post formats for galleries, videos, audio, and much more. The theme is multilingual-ready for those times when you need to translate the text in your courses. You also gain access to over 80 shortcodes, which come in handy for both beginners and advanced users. The theme has an advanced backup for when something goes wrong, and the customizable typography can drastically change the mood you set on your school site. We like the custom widgets for course comments and social sharing buttons. You even get multiple color options to match the website with your school colors. Finally, the Flat University WordPress theme delivers a two-step installation and a filterable portfolio, rounding out the strong set of features. This post may contain affiliate links, which means ThemeShift may receive compensation if you make a purchase using these links.